Perogies & Gyoza: Don't Want to Go to Bed? Don't Want to Go to Bed? Published by: RIC Shuppan Hanbai Inc. It's the last day of my summer vacation, and it was the hottest so far too. In these hot days around Obon (when Japanese people great their ancestors whose spirits come to visit), we try to do as much as we can to cool down. Two traditional ways are to talk about things that are cold (like with the book Red Is Best) , and talk about things that are scary enough to cause shivering (like ghosts!). The picture book display at the library is all about ghosts now. It looks a lot like Halloween, actually. This is one of the most famous, as it was published in 1969 so all the parents my age remember it and buy it for their own kids. It's a simple story designed for the preschool set. Basically, it's time for bed and the kid in the book is still awake. So this book is there to scare the kid to sleep. The child is asked who else is awake at this time? Owls and thieves and ghosts, of course! So if you don't want to be whisked off to Ghostworld you better go to sleep! I think that there is a tendency to frighten small children into good behaviour in Japan more than there is in Canada at least. I've heard parents tell their kids that Obake (ghosts) will come if they don't stay on the sidewalk or stop another undesirable behaviour. Not that this is only found in Japan. When my brother and I were particularly bad my parents threatened to have Igor Vicious come and babysit for us. That was scary!!! I think the difference is in not scaring kids to sleep. When I had bad dreams or thought there was something under the bed my parents came to comfort me, my dad brought a flashlight to check and show me there was nothing, and sometimes a hammer to smash the bad guy away if found. I was never told the monster under the bed would get me unless I went to sleep right away! I am not really sure if this technique works or not, I don't think it would have on me when I was a kid. The book is easy to read and the characters are pretty cute for preschoolers. The translation is great too, and Howlett (Little Daruma and Little Tengu) and Macnamara are both very experienced Japanese - English kidslit translators. It would be such a great little book if it wasn't for the express purpose of scaring the pants off a kid! 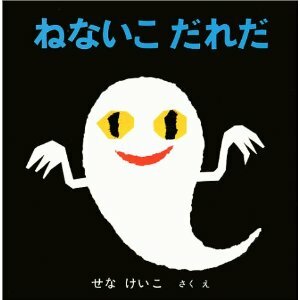 My son read this to me, he's the one who likes ghosts. My daughter was engaged elsewhere at the time because I know she would be scared by this. Even though he likes ghosts, he's had me hold his hand to sleep for the last few nights since he read this. I'd really like to read more by this author that isn't scary! postingan yang bagus tentang Don't Want to Go to Bed? I'm totally going to make cardboard cut outs of this cute ghost and post it all over our house this Halloween! It's adorable, isn't it? Still scares the pants off me though. I'm a scaredy-cat!